Casco Bay Line ferries docked at the Portland, Maine harbor. Maine is a state with countless hidden treasures. From secluded waterfalls and rocky coastlines to charming lighthouses and bustling towns, Maine has something to attract everyone. With 3,478 miles of shoreline and approximately 4,600 islands off the coast of Maine, the ocean is an important part of everyday life. Ferries provide a convenient way to travel between the mainland and these islands, serving visitors to the area as well as long-time residents. Several ferry lines offer service to the Downeast and Acadia region of Maine. The Bar Harbor Ferry runs five times daily from Bar Harbor to Winter Harbor, offering views of lighthouses, mountains, and small fishing villages. The ferry operates seasonally from June to September, costing $29.50 for adults and $19.50 for children. Tickets are available online at http://www.downeastwindjammer.com/bar-harbor-ferry/. Ferries to the Cranberry Islands offer excellent views of Acadia National Park and stunning ocean scenery. The Cranberry Cove Ferry departs South Harbor six times daily from May to October, traveling to Great Cranberry Island and Little Cranberry Island. A round-trip journey takes approximately two hours and costs $27.50 for adults and $20 for children. The Beal & Bunker Mail Ferry operates year-round, traveling from Northeast Harbor to the Cranberry Islands. Travel to nearby Sutton Island or car transportation via a barge can be arranged upon request. The Beal & Bunker Ferry costs $28 round-trip for adults and $14 for children; call (207) 244-3575 for ticket information. 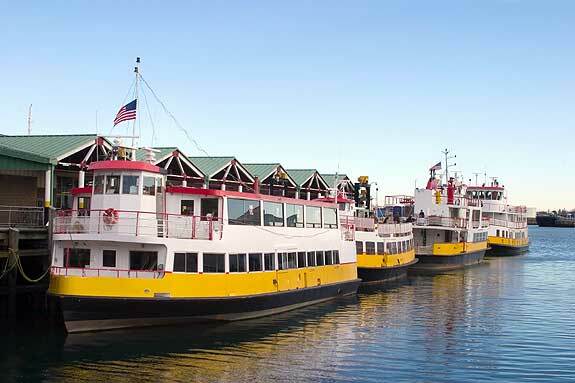 Two state-operated ferries run from Bass Harbor to nearby islands. The ferry to Swan’s Island takes 40 minutes and costs $17.50 for adults and $8.50 for children. The Frenchboro Ferry offers transportation from Bass Harbor to Frenchboro, a crossing of 8.25 miles that takes 50 minutes. Fares are $11.25 for adults and $8.25 for children. Both the Swan’s Island and Frenchboro ferries operate year-round, although their schedules change seasonally; check http://www.maine.gov/mdot/msfs/ for more information. Visitors to the Midcoast region of Maine have several transportation options to nearby islands. Three services run from the mainland to Monhegan Island, a destination popular with bird-watchers, artists, and hikers. Balmy Days Cruises offers an excursion to Monhegan Island, with a ferry leaving Boothbay Harbor at 9:30 a.m. and returning at 4:15 p.m. Fares are $32 for adults and $18 for children; visit http://www.monhegandaytrip.com/rates.htm for details. Hardy Boat Cruises offers another day-trip option to Monhegan Island and operates from May to October. The ferry departs from New Harbor for a 50 minute ride to the island. On the return trip, ferry riders enjoy a complimentary seal watch that describes the biology and history of the local seal population. The round-trip cost is $33 for adults and $18 for children; more information is available at http://hardyboat.com/monhegan_ferry.htm. The third ferry service is the Monhegan Island Boat, which departs from Port Clyde. This route offers views of Maine’s rocky coast and lighthouses as well as puffin sightings. The ferry operates year-round, costing $32 for adults and $18 for children. The Maine State Ferry service offers three ferry lines from Rockland to nearby islands. These ferries travel to Vinalhaven, North Haven, and Matinicus Island and operate year-round. The Vinalhaven and North Haven ferries take approximately 70 minutes and cost $17.50 for adults and $8.50 for children. The trip from Rockland to Matinicus Island is longer, taking two hours and 15 minutes, but visitors are rewarded with excellent views of the rugged, remote island. The Matinicus Island Ferry costs $33 for adults and $17 for children. Another state-run ferry operates from Lincolnville to Islesboro, a 20 minute journey. Casco Bay Lines offers several ferry trips departing from Portland. Visitors may travel to Peaks Island, Little Diamond, Great Diamond, Long Island, Diamond Cove, Chebeague Island, or Cliff Island using this service. Fares vary from $7.70 to $11.55 for adults, and schedules change seasonally. Check http://www.cascobaylines.com/default.htm for more information. Another option for transportation to Chebeague Island is the CTC Ferry, which travels from Yarmouth to the island, a 20 minute journey. Fares are $13 for adults and $3 for children. Chebeague island offers a variety of opportunities for observing birds, seals, porpoises, and lobster fishing.